A quick view of the most influential metrics in Glenwood Estates. The affluent neighborhood of Glennwood Estates, just a short walk northeast of downtown Decatur, features spacious single-family homes on generous lots. Residents can enjoy the adjoining two-acre Glenn Creek Nature Preserve as well as Glenlake Park, which offers a tennis center, pool, picnic areas, volleyball and basketball courts, and walking trails. The Suburban Plaza development is under construction just north of Glennwood Estates. When complete, that project will include a Starbucks, revamped bowling alley, LA Fitness, Walmart, HomeGoods, AT&T, Ross Dress for Less, an organic restaurant, and a variety of other retail and dining options. 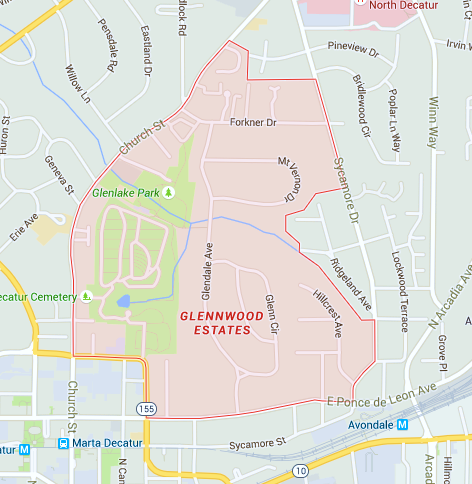 Check out the latest demographic information available for Glenwood Estates. Learn more about schools near Glenwood Estates complete with ratings and contact information. Browse through the top rated businesses in the most popular categories Glenwood Estates has to offer.